In this tutorial, We are going to explain how to set button onPress Event in react native application. A basic button component that should render nicely on any platform. Supports a minimal level of customization. In this demo we are applied onPress Event on button and calling buttonClickListener() function, when user clicks on button. 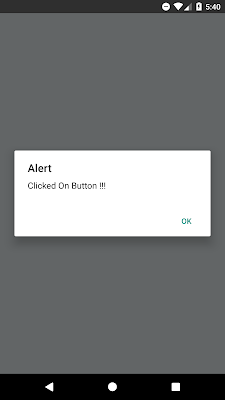 Lets see the below source code that helps, you to bind an event on button, when user clicks on it. This is a main Component where we have bind onPress Event on button. Follow the below steps, that helps to configure onPress event on button. 1. Add Button Component in import block. 2. Add Button tag in render’s return block. onPress event is fired, when the user clicks on button. In this case it will call the buttonClickListener() function. title : Set the button title or name. color : Set the button color. 3. Binding an event to class. 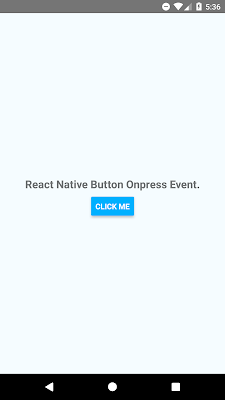 React Native Button Onpress Event.